In most of the reported experiments, casein or mixtures of amino acids simulating casein were used (Clark, 1975; Thomas and Chamberlain, 1984; Oldham, 1994). Overall, infusion of casein or corresponding mixtures of amino acids increased the yield of protein and lactose substantially but the apparent recovery of infused amino acids in milk protein varied widely, between 10 and 50% (Clark, 1975; Choung and Chamberlain, 1993a; 0rskov et ai, 1977; Whitelaw et ai, 1986; Bequette et ai, 1998). The increases in protein yield were often accompanied by increases in the concentration of protein in the milk but effects on the yield and concentration of milk fat were variable. Furthermore, clear responses of milk production were seen with basal diets varying in crude protein content from 110 to 200 g kg-1 (Chamberlain and Thomas, 1982; Oldham, 1994). The consistent positive responses to casein infusion, irrespective of the level of protein in the diet, might indicate endocrine mechanisms, involving especially growth hormone and insulin (see Oldham, 1994). However, more recent work shows that an enhanced supply of amino acids can increase milk production without affecting arterial concentrations of growth hormone, insulin or prolactin (Guinard et ai, 1994; Metcalf et ai, 1996a). It therefore seems that the responses are to nutrient supply in itself rather than to changes in hormone secretion but this is not to say that hormones may not play a secondary role in some circumstances. We should not be surprised that dairy cows respond to additional protein given postruminally when the basal diet itself is high in protein; results of feeding trials show milk protein yield responded even to a change of dietary CP content from 190 to 220 g kg-1 of DM, when supplements were high in rumen-undegradable protein (UDP) (see Chamberlain et ai, 1989). Responses such as these fit more comfortably within the framework of nutrient responses (BBSRC, 1998) rather than the more rigid framework of nutrient requirements (AFRC, 1992). An unwelcome by-product of requirement-based systems is that they lead to a tendency to rule out positive responses to provision of nutrients in excess of 'requirement'. Table 20.1. Responses in the yields of protein, lactose and fat to postruminal infusions of soy protein isolate (SPI) expressed relative to the responses to corresponding isonrtrogenous infusions of caseinate. Calculated from milk yield assuming 47 g lactose kg 1 milk. the relative responses of milk protein yield to isonitrogenous infusions of the two proteins. On average, SPI was about 50% as effective as casein in stimulating the yield of milk protein; corresponding figures for lactose and fat were more variable but, again, generally the values were below those obtained with casein. SPI and casein have very similar intestinal digestibilities (Beynen et al., 1990), and so it is likely that these differences between the two proteins stem from their different amino acid compositions. Indeed, it is worth noting that the proteins differ most in their content of methionine, for which SPI contains only 45% of the level in casein (Choung and Chamberlain, 1993a). 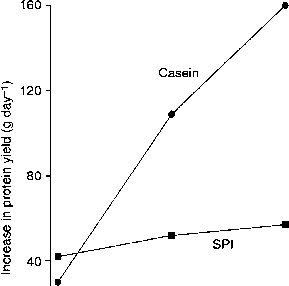 The effect of the lower quality of SPI relative to casein is illustrated in the results of an experiment in which three levels of infusion of the two proteins were compared (Fig. 20.1). Although the response to casein was virtually linear, there was no further response in the yield of milk protein beyond the first level of SPI. Taken at face value, these results indicate that the consistent positive responses in postruminal infusion experiments with casein and corresponding amino acid mixtures (see above) might overestimate responses obtainable with proteins more typical of ruminant feeds. Moreover, it is uncertain whether amino acid composition explains all of the difference in protein quality. Even when amino acids were added so as to make the two proteins equivalent in the supply of all the amino acids, the response to casein remained superior to that of SPI (Choung and Chamberlain, 1992a). The possible role of factors such as the pattern of release of peptides, some of which can be biologically active, has yet to be defined. It is known that some of the p-casomorphins, released during digestion of p-casein, can influence insulin secretion in the cow (Kim, T.-G. et al., 2000) and could, therefore, affect the supply of nutrients to the udder (Vernon, 1988). 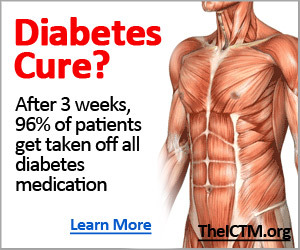 These effects of bioactive peptides serve as a further warning against regarding casein as merely a high-quality feed protein. 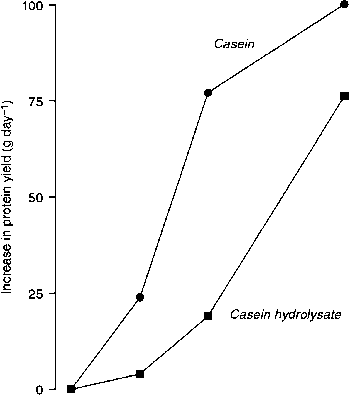 hydrolysate was less effective than whole casein in stimulating the yield of milk protein (Fig. 20.2), a finding confirmed in a second experiment that compared whole casein to a corresponding mixture of free amino acids (Choung and Chamberlain, 1995a). Further investigation (Choung and Chamberlain, 1995b) showed that, in comparisons of infusions of hydrolysates of casein containing different proportions of free amino acids and peptides, the ability of the infusate to stimulate the yield of milk protein was directly related to its content of peptide-bound amino acids. It is not known why free amino acids entering the small intestine should be less effective than protein-bound amino acids in stimulating the secretion of milk protein. Greater nitrogen retention in rats fed whole casein compared with a corresponding mixture of free amino acids was put down to a slower gastric emptying, slower rate of entry of amino acids into the blood and more efficient utilization for tissue protein synthesis (Daenzer et al., 2001). CAS or CAS hydrolysate infused (g day-1! However, amino acids in peptide form are absorbed faster from the gut (Rerat et al., 1988). In pigs, the faster appearance of amino acids in portal blood from peptides, as against corresponding mixtures of free amino acids, was associated with increased secretion of glucagon (Rerat et al., 1988). A similar effect on plasma concentrations of glucagon was seen in the experiments in dairy cows referred to above (see Choung and Chamberlain, 1998). Although insulin levels were little affected, the increased secretion of glucagon lowered the insulin/glucagon ratio, which could stimulate nutrient use by the mammary gland at the expense of other tissues (Bassett, 1975). Again, absorption of peptide-bound amino acids is more homogeneous than that of corresponding amino acid mixtures, such that the amino acid profile in portal blood better represents that of the infusate (Hara et al, 1984; Rerat et al., 1988). 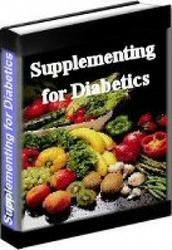 It may be that infusion of free amino acids leads to an unbalanced profile of amino acids reaching the liver. How this might affect metabolism in the liver, and the supply of nutrients to other tissues is uncertain. Earlier claims (see Rook, 1983) that slight amino acid imbalances increase the use of the first-limiting amino acid for protein synthesis in the liver, so reducing its availability for protein synthesis in other tissues, have since been questioned (see Davis and Austic, 1994). 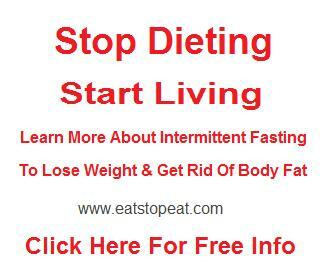 Indeed, it has recently been shown that amino acids from dietary casein, as opposed to corresponding free amino acids, are more readily incorporated into liver and plasma proteins (Daenzer et al., 2001).